No matter the sport, Junior Sports Games has the game kids want to play! Choose from these popular sports activities: football, soccer, basketball, baseball, dart/Frisbee, all under one inflatable play structure. Encourage team spirit and friendly competition as children play their favorite game simultaneously and facilitate variety as participants have the chance to play each sport. 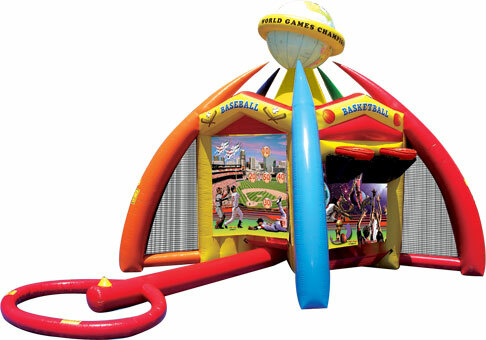 This colorful inflatable sports game adds great value to an FEC. Check out the new Junior Sport Games that offers the exact same games as its big brother, but in a perfect size for smaller kids. Both sports structures are constructed of lightweight and fire-resistant ultra lite n strong™ vinyl, and will be a welcome attraction to any indoor or outdoor event, from a gymnastics club to a backyard barbeque.